"John Sexton's images portray idyllic landscapes in moments of rare beauty–seductive, mysterious, and vaguely familiar. Time slows down, movement ceases, the world becomes quiet, and if we are patient, the subtle whisperings of the land may be heard." "John Sexton is one of the most distinguished artists in the field of photography." 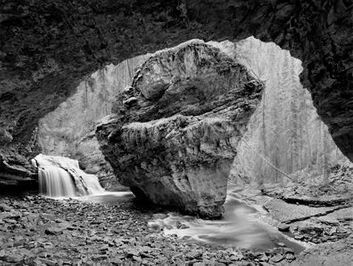 "John Sexton is the contemporary master of black and white silver photographic processes. His beautiful prints are the best examples of a process at its peak, the handmade artifacts of a demanding craft. " Recollections Autographed First Edition copies of John Sexton's award-winning book, Recollections. Places of Power Autographed copies of John Sexton's award-winning book. This handsome collectible book is now out of print. Quiet Light Bramd new autographed First Edition copies of this hard to find, out of print, collectible classic by John Sexton. Very few copies are still available. Listen to the Trees Autographed copies of John Sexton's wonderful homage to trees. This handsome book is now out of print. Autographed John Sexton Posters A wonderful selection of autographed posters by John Sexton. Beautiful Books by Other Photographers A wonderful selection of beautiful, hard-to-find, photographic books by superb photographers.Includes books Mark Citret, Ray McSavaney, and Huntington Witherill. Many of these books are autographed by the respective photographer. Ansel Adams Photographer DVD A classic documentary from the 1980's - now on DVD! See Ansel working in the darkroom, photographing in Yosemite, and visiting with his longtime friend Georgia O'Keefe at her home in New Mexico. 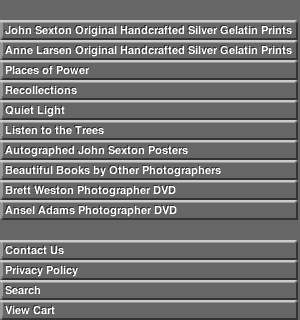 Brett Weston Photographer DVD Brett Weston Photographer - A film by Art Wright Now on DVD this is an intimate portrait of the legendary photographer Brett Weston. In addition there are 892 reproductions of Bretts striking immages! Copyright © 2000 - 2019 Ventana Editions. All rights reserved.